The title of this post is the same as that of this this article on the International Rail Jotnal..
Irish Rail (IE) and British rolling stock leasing company Porterbrook have signed contracts with Rolls-Royce for the supply of 13 MTU Hybrid PowerPacks, the first firm orders for the hybrid rail drives. Other points are made in the article. IE has ordered nine PowerPacks for Class 22000 trains. If the technology works they intend to convert all 63 trainsets, which will need 234 PowerPacks, as each car has a diesel engine. Porterbrook has ordered four for Class 168 and Class 170 trains. The PowerPacks will be delivered between mid-2020 and 2021. The MTU engines are built to EU Stage 5 emission regulations. The PowerPacks can switch to battery power in stations and sensitive areas. Operating costs are significantly reduced. The PowerPacks have regenerative braking, thus they reduce brake pad wear. Due to electric power, the trains have been acceleration, which may reduce journey times. It seems that passengers, train operating companies, train leasing companies and those that live by the railway are all winners. If the concept works reliably and meets its objectives, I can see MTU selling a lot of Hybrid PowerPacks. Which Operators Will Be Used For Trials? This is a valid question to ask and I’ll put my thoughts together. These trains only run in Ireland with one operator;Irish Rail, so they will be used for trials. As each car has one MTU diesel engine and Irish rail are stated in Wikipedia as wanting to run three-car and six-car sets, could they be converting one train of each length? All the nineteen Class 168 trains of various lengths are in Chiltern Railway’s fleet, they will be the trial operator. Chiltern also have nine two-car trains, which could be ideal for trial purposes as they will need two Hybrid PowerPacks. Porterbrook own upwards of thirty two-Car Class 170 trains with CrossCountry, Greater Anglia and West Midlands Trains. As Greater Anglia and West Midlands Trains are replacing their Class 170 trains, this means that CrossCountry will soon be the only user of two-car units. The four two-car trains from Greater Anglia, will be going to Trains for Wales (TfW). TfW currently has sixty two-car Pacers in its fleet, which must be replaced by the end of 2019. TfW is bringing in the following trains. Nine four-car Class 769 trains from Porterbrook. This is a total of sixty-eight cars. So TfW are replacing a load of scrapyard specials with quality, more powerful trains, with approximately 13 % more capacity. TfW are proposing to use the Class 170 trains on the following routes. If the MTU PowerPack proves successful and leads to widespread conversion of the Class 168 and Class 170 fleets, will we see the twenty Class 171 trains and thirty-nine Class 172 trains converted to hybrid power? It looks like a good solid project to me! Will The Gospel Oak To Barking Line Have Long Term Capacity Problems? There are certainly, short term capacity problems on the Gospel Oak to Barking Line, (GOBlin) due to the non-delivery of the new Class 710 trains. There are a lot of similarities between the Gospel Oak to Barking Line and the North London Line (NLL). Both run roughly East-West across North London. Both have interchanges with the Underground, Crossrail and National Rail. Both have several freight trains per day. In addition, the Eastern end of the NLL and the GOBlin, run through areas of East London, where a lot of regeneration and housing development is ongoing. This picture was taken at Blackhorse Road station. The station is being surrounded, by a large amount of housing. When I moved to Dalston in 2010, the frequency of trains between Stratford and Willesden Junction stations was around six trains per hour (tph). The trains were three-car Class 378 trains, giving a capacity of 18 carriages per hour (cph). Now in early 2019, the frequency on the same section of the NLL is eight tph and the trains are five-cars, giving a capacity of 40 cph. This large increase of 120 percent, has not been enough to prevent trains on the NLL from being very full at times. But then there have been large housing and commercial developments at Stratford, Hackney Wick, Hackney Central, Dalston Junction and West Hampstead stations. Until a few months ago, the GOBlin had a frequency of four tph. The trains were two-car Class 172 trains, giving a capacity of 8 cph. The service from today is two four-car Class 378 and two two-car Class 172 trains per hour, giving a capacity of 12 cph. Hopefully, when the Class 710 trains are working, we’ll be seeing four four-car Class 710 trains per hour, giving a capacity of 16 cph. It is not the 120 percent increase that the NLL has already seen, but surely a 100 percent increase is better than nothing. For the last three of four years, Highbury & Islington station has been a station to avoid. There have been continuous roadworks in the area of the station. There have also been several water-main bursts. The bus service between the station and my house has been halved in frequency. Consequently, if I’m coming East to my home, I find it a lot easier, but slightly slower to change to the GOBlin at Gospel Oak station and then get a bus home from Harringay Green Lanes station. So if a GOBlin train is waiting at Gospel Oak station, I take that route. Helpfully, Transport for London have improved the cross-platform interchange. They’ve also added more stairs to the right of these. I actually, think, that passengers wanting to go to areas between the two lines are starting to use the GOBlin, as often by Harringay Green Lanes station, a lot of passengers have left the train. Londoners are just practising their ducking and diving! I’ve also left Barking a couple of times in a very full train in the Off Peak. Passengers for whatever reason, seem to be using the GOBlin more! Do clean electric trains attract passengers more than less friendly diesels? Does the occasional four-car journey impress passengers with more space? Is it since the Class 378 trains took over some duties, that the service is more reliable? Or perversely could it be, that all the bad publicity about the GOBlin has reminded people that it is still there and might be worth a second chance? Will The Proposed Gospel Oak To Barking Line Be Enough In The Long Term? I am rapidly coming to the conclusion, that although capacity on the GOBlin is going to be doubled, when the new Class 710 trains arrive, this may not be a large enough increase for the long-term. What Measures Can Be Taken To Increase Capacity? There are some simple measures that can be taken. Transport for London are planning to run five tph in the Peak this year. If it happens, this will increase capacity by a small amount, where it is needed. But it probably can’t be a general increase, as that would probably restrict the number of freight trains. The electric Class 710 trains probably have a higher performance than the diesel Class 172 trains. This will help with running higher frequencies and faster services, but on its own, it won’t increase capacity. The Class 710 trains are Aventras, and these trains have been ordered up to ten cars by other operators. So five- or six-car trains would certainly be possible. But the problem is that some platforms would need to be lengthened. Barking already handles longer trains. Upper Holloway, Crouch Hill, Harrigay Green Lanes, Walthamstow Queens Road, Leyton Midland Road, Leytonstone High Road, Wanstead Park and Woodgrange Park used to have longer platforms, which might be possible to reinstate. Blackhorse Road, South Tottenham and Gospel Oak would be major undertakings. Five-car trains might be possible, if selective door opening was used at the last three stations. Five-car trains would increase the capacity to 50 cph or an increase of twenty-five percent on the capacity after the Class 710 trains are successfully introduced. I am very sure, that the only way to increase the capacity of the Gospel Oak to Barking Line, would be to run longer trains. But they would need to use selective door opening at Blackhorse Road, South Tottenham and Gospel Oak stations. After the problems of platform lengthening on the East and North London Lines, why weren’t platforms at least prepared for five- or even six-car trains, when the GOBlin was rebuilt and electrified? The second Class 378 train; 378206 is now in service on the Gospel Oak to Barking Line. I have had a thought about these trains and also the Class 710 trains, which will have a similar interior. At two in the afternoon on the short trip between Gospel Oak and Harringay Green Lanes stations about three-quarters of the seats were occupied. I would estimate that there were perhaps 160 passengers on board. As the Class 172 trains have only 124 seats, I feel that the electric trains and all the publicity are attracting passengers. It would appear that this week, the Gospel Oak to Barking Line’s hybrid fleet of five two-car Class 172 trains and one four-car Class 378 train have performed reasonably well. But there is no good news about the Class 710 trains. It does appear from the RidingTheGoblin Twitter Feed, that there have been some train failures on the Gospel Oak to Barking Line. As the type of train has not been specified, I would assume that the sole Class 378 train has been yomping between Gospel Oak and Barking stations, with all the reliability of an SAS soldier. If the Class 378 train had failed, I’m sure that various news sites would have used the fact, to give Transport for London, the Mayor or Bombardier a good kicking. Currently, the full fleet is one four-car Class 378 train and five two-car Class 172 trains. If one Class 172 train goes AWOL, this means there will be a 17 % reduction in services, but only a 14 % reduction in capacity. If two Class 172 trains go AWOL, this means there will be a 20 % reduction in services , but a 29 % reduction in capacity. On the other hand, if the fleet was thwo four-car Class 378 trains and four two-car Class 172 trains, this would result in no reduction in services and a 14 % increase in capacity. \swap another train from a 172 to a 378 and the capacity rises by 29% above what is in service now! The only problem, I can see, is that the mixed fleet with its higher capacity, may attract more passengers, which could cause overcroding, if the Class 710 trains fail to arrive in the projected mid-March. Since modernisation in 2010, the service on the Gospel Oak To Barking Line has been run using six two-car diesel Class 172 trains. Today was the first weekday, when one of the diesel trains had been replaced by a four-car electric Class 378 train. 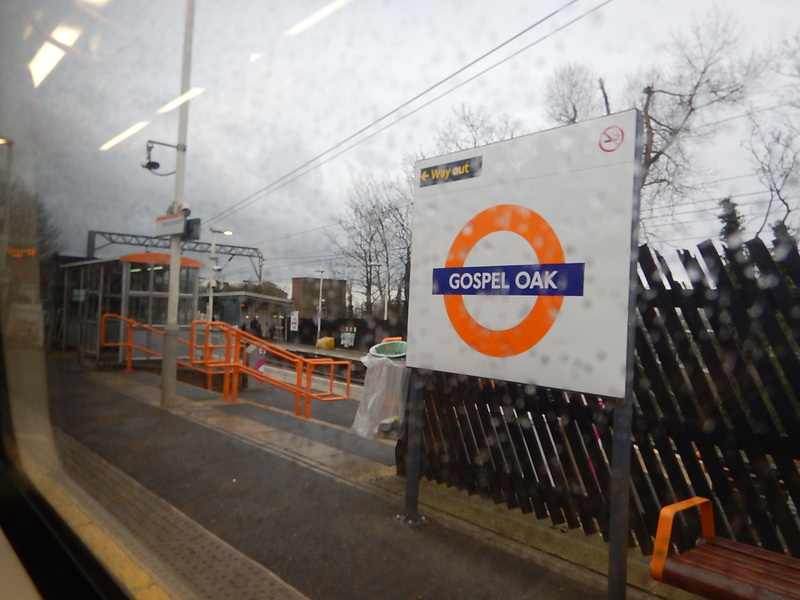 I was able to ride on a Class 378 train between Harringay Green Lanes and Gospel Oak stations. I then doubled back and travelled all the way East to Barking station. These are a few observations. Riding the electric Class 378 trains is a very different experience to riding the diesel Class 172 trains. There is a lot less noise and vibration. You sit longitudinally in London Undergound fashion, as opposed to transversely. There was more capacity in the four cars of the electric train, as opposed to the two-car diesel trains. I also got the impression that the Class 378 trains accelerated faster and cruised at a higher speed, than the Class 172 trains. I will check this out. I said in the previous section, that physical capacity is doubled from two to four cars. I actually went from Harringay Green Lanes to Gospel Oak twice in the morning Peak; once in a Class 172 and once in a Class 378. The former was jam-packed and the second was very comfortable, with only a few stansdees. The Class 172 train has 120 seats in a 47 metre train, which works out as 2.6 seats per metre. The Class 378 train has 136 seats in a 80 metre train, which works out at 1.7 seats per metre. The lower seat density and the wide central isle, probably explains, why the electric train was more comfortable. Note that in a few months, the Class 378 trains will be replaced with Class 710 trains, which will likely have a similar passenger capacity to the Class 378 trains. So the capacity and passenger ambience of the Class 378 trains can probably be read across to the internally-similar Class 710 trains. I did my usual trick of riding in the last car and looking at where the end of the train came on the platform. The line has been built, so that all platforms fit the standard British Rail four-car length of eighty metres, which applies to both four-car Class 378 and Class 710 trains. London Overground run five-car trains through four-car stations at Shadwell, Wapping, Rotherhithe and Canada Water on the East London Line, by allowing the last car to overhang the platform. They get away with it without any trouble because. The Class 378 trains have selective door opening and a walk-through interior, with large lobbies. The announcements on the train are high-quality and advise passengers in the last car to move forward at short platforms. So could five-car trains be run the Gospel Oak to Barking Line? Barking station has a long platform. Some stations like Woodgrange Park, Wanstead Park, Leytonstone High Road, Leyton Midland Road and Upper Holloway originally had longer platforms and these could probably be extended. Other stations like Gospel Oak, South Tottenham and Blackhorse Road are probably at maximum length and would use selective door opening. I suspect that if the demand needed the extra capacity, that the new trains could be lengthened from four to five cars, which would give a twenty-five percent increase in capacity. I have a feeling that the Gospel Oak to Barking Line doesn’t have well-defined typical passengers, like a lot of routes do. Using the train in the Peak, you notice that many passengers just hopped a couple of stops on the line. One guy was going from Harringay Green Lanes to Shoreditch High Street, with changes at Gospel Oak and Canonbury. This journey is probably a reflection on the badly-designed bus routes in the area it serves. The line is well-connected to the Underground, especially if you are up for a ten-minute walk. There are also good connections to North-South buses at several stations. Will Electric Trains Attract More Passengers? I suspect London Overground will be looking at the passenger statistics on the route with considerable interest, during the period, when some trains are two-car diesels and the others are four-car electrics. This may well give the answer to my question. I have a feeling that the reduced crowding on the route will mean that more passengers are attracted. The new Class 710 trains will have wi-fi and USB charging points, so I wonder how many passengers this will attract. But as I said earlier, a twenty-five percent increase in capacity may be possible by adding another car to the trains. I have a very strong feeling that the upgrade to the Gospel Oak to Barking Line and the new electric trains, will change North-East London for the better. As the London Overground lines to Cheshunt, Chingford and Enfield Town are also getting new trains, I would suspect that the effects will be bigger and more widespread than anybody has predicted. New stations will be added to the network. We could even see a serious outbreak of London Overground Syndrome. 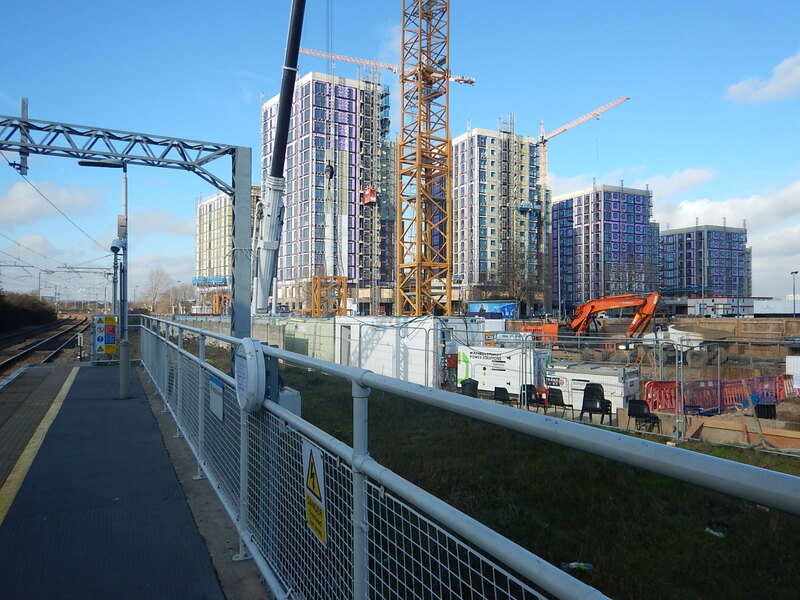 These are projects that will or could happen along the Gospel Oak to Barking Line. Extension to the new Barking Riverside station. A new station at Cann Hall. A direct link between Walthamstow Queens Road and Walthamsow Central stations, when the latter is upgraded. South Tottenham station will be on Crossrail 2 and could be on a future Enfield Town-Stratford service. Harringay Green Lanes station could be connected to the Piccadilly Line underneath. Reopening of Junction Road station with a link to the Northern Line. At present only the first two will happen. 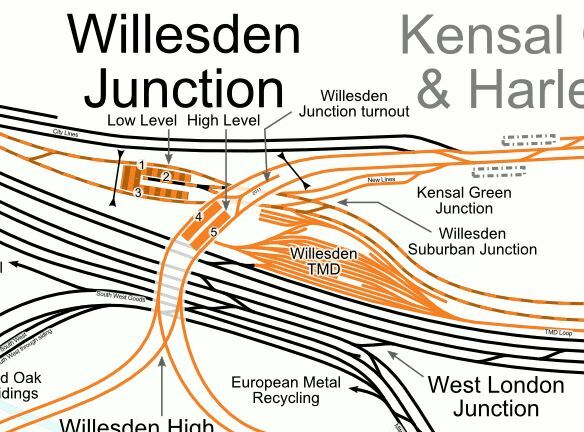 How Will Class 710 Trains Access Willesden TMD? This map from carto.metro.free.fr shows the track layout around Willesden TMD, where the Class 710 trains for the Gospel Oak to Barking Line (GOBLIN) will be stabled. Note the following lines around Willesden TMD. The North London Line goes through platforms 4 and 5 at Willesden Junction station. South of the station it splits, with the North London Line continuing to Richmond and the West London Line going to Clapham Junction. North of the station the line continues to the East and at Gospel Oak station, the GOBLIN branches away. The shared tracks of the Bakerloo Line and the Watford DC Line, which are shown in black/orange go through platforms 1 and 3 at Willesden Junction station. To the East the tracks go towards Euston and to the West, they go towards Watford. There is also a bay platform 2 in Willesden Junction station, which is shown in these pictures. Note that is long enough to take a five-car Class 378 train and that it is also electrified with London Underground’s four-rail electrification. Looking from the train this morning, I don’t think this pair of tracks is electrified, so it doesn’t allow Platform 2 to be used to turn electric trains running on the North London Line. I have seen Platform 2 used as a terminus, but the trains must use the electrified route via Primrose Hill. After greatkingrat’s comment, I went back and had a second look. 25 KVAC overhead electrification can be seen at the North London Line end of the tracks. This Google Map shows, where the connecting tracks join the Bakerloo/Watford DC Line. It does appear that the third-rail and a couple of gantries are visible. Trains leaving Platform 2 should be able to use third-rail electrification until they are under the overhead wires, when they would change over. Trains arriving at Platform 2 would use overhead wires, as far as they could and then swap to third-rail. If this route is to be used by new Class 710 trains, I’m sure it will get more than adequate testing. I am not sure, how Class 378 trains working the Watford DC Line service transfer to and from Willesden TMD, but it does appear there are some convenient crossovers. I have looked at Real Time Trains and early in the morning of the 9th of January, these trains called at Platform 2 at Willesden Junction station, that originated at Willesden TMD. There were also other services, which appeared to be going between Euston and Stratford. It looks to me that trains were being positioned to start service and that the bay platform 2 at Willesden Junction station is used to reverse trains, coming out of the depot. It also appears that some trains use the electrified route to the East via Primrose Hill. The 05:02 and 05:15 are Class 172 trains going to the GOBLIN, and as they are diesel trains, they use the pair of direct tracks, that connect to Platform 2. How Will Class 710 Trains Go Between the GOBLIN And Willesden TMD? As the Class 710 trains will be dual voltage trains, they should be able to take the direct route, which has both types of electrification and requires a change at some point. They can also take a roundabout route possibly via Primrose Hill and using Platform 2 at Willesden Junction station to access the depot. But I suspect Class 710 trains will have battery power. This would enable them to take the same short cut, but without using the electrification, between Platform 2 and the North London Line, that the Class 172 trains use currently. Dual-voltage Class 378 trains should be able to use the short route. Fitting batteries to Class 710 trains, would make their operation on the GOBLIN, a lot easier, as they could use the batteries to get in and out of Willesden TMD. Could it be that the software that handles power and charges and uses the batteries, is the unreliable software? This article on Rail Magazine is entitled Gospel Oak-Barking Fleet Plan Remains Unclear. I also think that for a train to work the GOBLIN and be stabled at Willesden TMD, it must be a dual-voltage train or have a capability to run on batteries.